But before anyone can walk down the aisle, Val is accused of murder. Murder of a man she only met once and barely talked to. The police are throwing crazy theories at Val, trying to get her to confess. Her only hope is her best friend Sebastian’s rich uncle, Wellington Brown, a famous hot shot L.A. lawyer. With so many accusations against her, Val has to find the real murderer before she ends up in jail. But her options are limited, and the detective whom she hoped would always be at her side seems ready to betray her as well. With possible corruption in the air and the media convinced she’s guilty, Val feels like the verdict is decided before she can even get into the court room. With the bride and groom on her side, can Val investigate a murder and pull off a high-profile wedding at the same time? 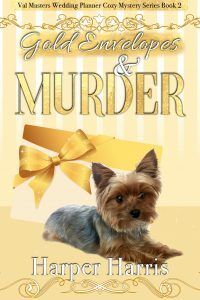 Gold Envelopes & Murder is a full length cozy mystery novel. It is Book 2 in the Val Masters Wedding Planner series, which can be read in any order and are best enjoyed together. Harper Harris is a small town girl with a big imagination. She enjoys coming up with mysteries and trying to solve them.